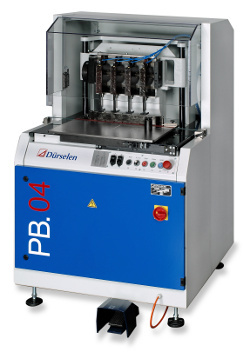 Paper drilling machines is the generic term for manual, motorised and fully automated paper drills. The phrase paper drill is used as well for paper drilling machines as for the tools used for paper drilling.Paper drilling systems describes an automated paper drilling machine usually integrating several production steps into one continuous workflow. Paper drilling is a method to drill round holes into paper and other materials. For this purpose hollow paper drill bits are clamped into a driven spindle which drills into the pile of paper. Paper drill bits are available for different hole sizes and in different coating qualities. Unlike to punching a whole pile instead of only single sheets can be processed with a paper drilling machine. Depending on the type of paper drill either the paper drill bits are lowered into the pile or the table is lifted. A paper drilling machine can be equipped with a different number of spindles which are each built into one paper drill head. The range starts with one- and two- spindle paper drills for small volumes and office purposes and reaches up to paper drilling platforms with 22 spindles / paper drill heads. Applications for paper drilling are e.g. file holes for different ring binders, loose leaf collections, rows of holes for wire comb binding and tags. Many products processed on a paper drilling machine are stationery. Additionally catalogues, manuals and brochures are drilled on a paper drilling system to be able to file them in a binder. Sometimes the drilled holes are used for decorative purposes. Additionally to different stock types - glossy paper, coated papers - a modern paper drilling machine can drill many other materials like plastic films, cardboard, foils etc. Paper drilling machines are used in trade binderies, commercial print shops with finishing department, in-house print shops and copy shops. Depending on the volumes these companies operate many different types of paper drilling machines - from simple one- and two-spindle hand operated table top paper drills to standard motorised four- spindle paper drilling machines and fully automated, integrated paper drilling systems. These high performance paper drills can run in-line with other finishing equipment.